If you’re into concept art or 3D modeling then you should know about ZBrush. It’s one of the most popular tools for digital sculpting and for creating incredibly lifelike models. The biggest problem with this software is just getting started due to its overly complex nature. We’ve suggested various books for learning ZBrush and there’s one new title that deserves a mention. 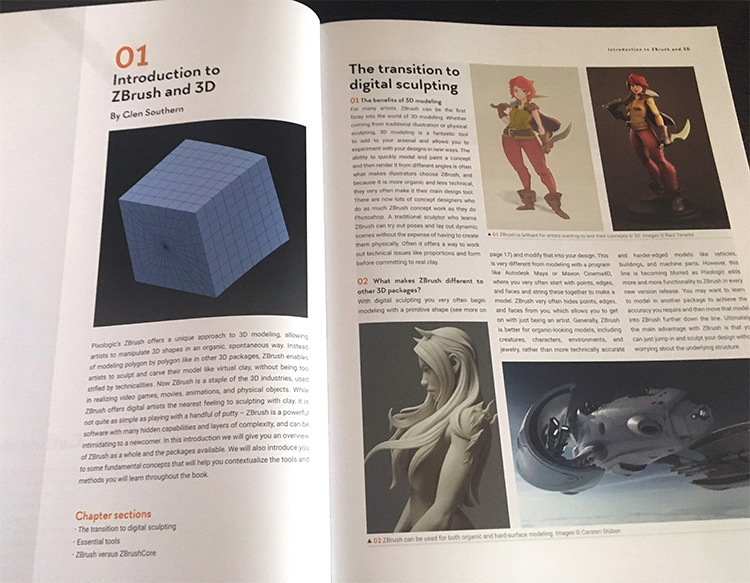 The Beginner’s Guide to ZBrush was first published in early 2018 by the folks at 3DTotal Publishing. It’s a massive guide spanning over 250+ pages of tutorials, intro guides, and practice projects. It’s one of the best intro books for ZBrush newbies, but talk is cheap. Let’s dive in and see what it has to offer. 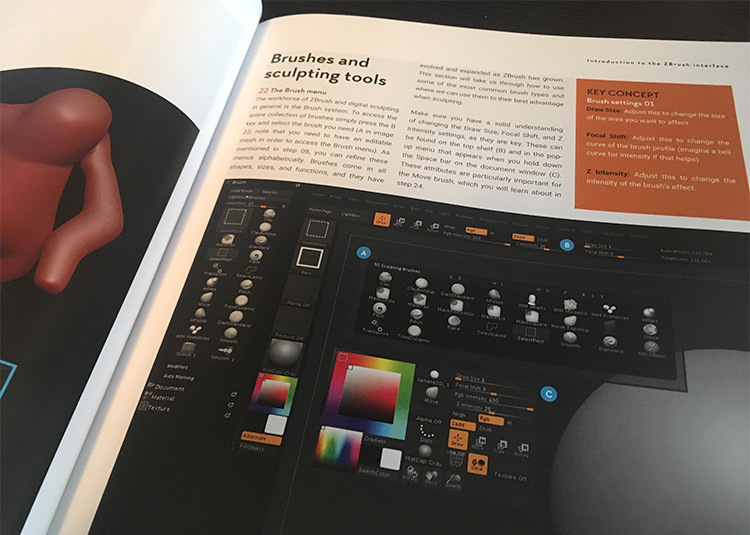 With this book you can pick up ZBrush from scratch and still work through the materials comfortably, even with no prior experience. Early chapters explain why you’d use ZBrush in your day-to-day workflow and how it meshes into the 3D landscape. You’ll also get a complete introduction to the ZBrush interface which can be, by all accounts, pretty confusing. The main chapters break down into three sections: “Getting Started”, “Projects”, and lastly a more advanced section called “Beyond ZBrush”. These pages are filled to the brim with screenshots and the directions are extremely clear for each section. A complete newcomer should be able to pick up this book and work through the lessons with relative ease. The writing style is real easy to digest as well. Most of the photos show you how to work through ZBrush with a typical workflow. This includes arrows, circles, and labeled diagrams so you can see exactly what you’re supposed to do at each step along the way. Rendering tools, sculpting techniques, coloring, posing, these are all covered in just enough detail to get you moving forward with the software. I think I’m most impressed by the quality of the print job and the screenshots. They really are crystal-clear so you should never feel lost working through this book. I will say it’s not going to teach you everything about ZBrush or 3D modeling. I don’t think any single book could teach you all of that. However that’s also not the core goal of this book. 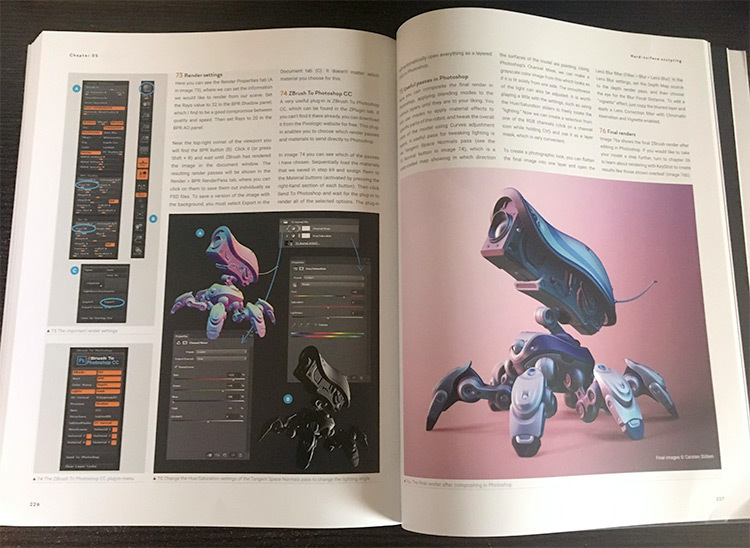 Beginner’s Guide to ZBrush delivers exactly what the title says: it’s a complete guide to the ZBrush software for beginners. 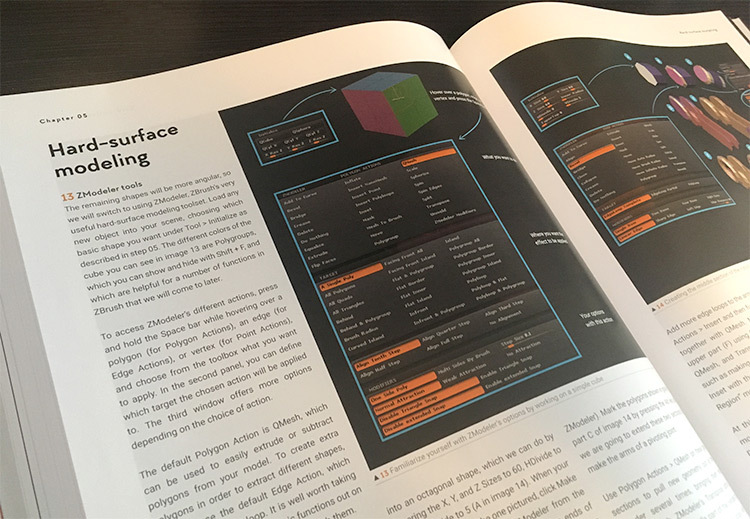 If you’ve never done 3D modeling or if you want to move into the 3D space then this book will help you learn fast through real-world projects and step-by-step lessons. Plus there’s hundreds of screenshots so you’ll get a quick familiarity with the program. I’d recommend this book to anyone who wants to learn ZBrush without having a mental breakdown. It really is that good of a learning guide. I know some people learn better from video tutorials and that may be your preference. But chances are if you prefer videos then you’re really more of a visual learner, and that’s exactly what this book offers. You learn by following screenshots of the ZBrush interface along with photos of project work. Diagrams & arrows point you along the way to explain very specific features that beginners need to know. Plus most chapters break down nicely with sub-headings for each of the core features in ZBrush, along with teaching you a step-by-step modeling process. If you’re looking to do any modeling or sculpting with ZBrush I highly recommend grabbing a copy of this book. It won’t take you all the way through everything but it will give you a solid foundation in ZBrush to learn the ropes fast, then apply that knowledge to all future practice projects.